Now most folks who pay a little extra for a hybrid do so because it fits their agenda. They care about the planet, or want to save money on fuel, or they see our dependence on foreign oil as a threat to our national security. These aren’t gear heads; they are people who view their car as an appliance or as a public projection of their beliefs. These folks would love Bison Organic Beer. 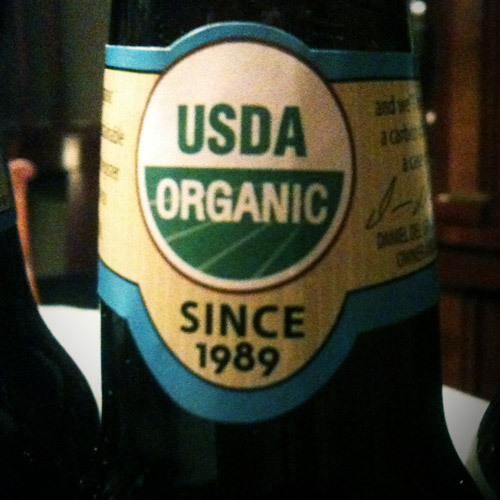 They would appreciate the fact that Bison only brews beers that are USDA certified organic. They would join Bison’s Carbon Offset Club. They would feel good that their beer purchase helps create energy efficient low-income housing in South Africa and helps preserve rainforests in Costa Rica. They also would delight in the light, easy drinking nature of Bison’s beers, each one a great gateway into the gentler pleasures of craft beer. They would drink Bison with satisfaction and pride. But not me – I want more. I want full-on, in-your-face flavor. I want huge malts wrestling with massive hops on the battlefield of my tongue. I want toe-curling taste and enough alcohol content to warm my chest. I want an SUV-sized brew, and I want it organic. I want the Cadillac Escalade Hybrid of beers. Instead of the Escalade, I got the Prius, the Fusion, the Insight and the CRZ. But that’s not what Bison sent me. Instead, I got the Prius, the Fusion, the Insight, and the Honda CRZ hybrid. Each of these accomplishes its mission with aplomb, delivering a taste that will satisfy the majority of casual beer drinkers while being friendly to both earth and body. The IPA is sweet, with just enough hoppiness to tickle the tongue without challenging it, and the brown ale delivers a malty backbone that is flavorful but won’t weigh you down. Both the Gingerbread Ale and Organic Chocolate Stout are a little watery for my tastes, but both deliver their signature flavors well enough. Each of these beers seem perfectly suited to someone who is looking to expand their horizons past Heineken and Blue Moon, but each struggles to satisfy a grizzled beer geek like me. I need a beer with more oomf. The slightly maddening part is that Bison makes such a beer – their 9.5% ABV Organic Barleywine. Unfortunately they didn’t send one along, and I can only wonder how tasting that beer might have help me form a more well-rounded opinion of their offerings. Instead, I’m left feeling like a selfish, power-hungry crybaby who wants more. More flavor, more booze, more satisfaction. More, more, more. Me, me, me. You know, like a Republican. But I’m not the only beer drinker in the world. Each one of the Bison beers I tasted would be easy to recommend to someone like my buddy Steve, who likes his beers flavorful, but not overpowering. They are also perfect for my friend Lisa, who isn’t a fan of huge flavors and who is very particular about where her food comes from. So while Bison’s beers don’t get me too fired up, your mileage may vary. Too bad you could not try the Bourbon Bbl imperial brown I had on draft last week from Bison. What you had was the “regular beers” like Fat Tire for New Belgium. These are in close to 20 states with chain grocery store placements. Look for Organic Barleywine to return soon and a Imperial IPA. And other specialty draft beers in certain markets. That’s what I figured, Tim – I got the common stuff. I don’t do well with the common stuff. 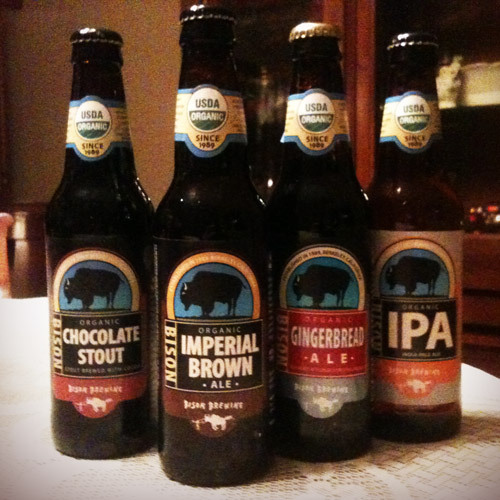 That said, these beers had good flavor and demonstrate that the folks at Bison know what they’re doing. I just need to taste what happens when they add more stuff to the kettle. That being said, the regular beers are certainly the minority in *my* fridge! I imagine organic=more expensive for beer as it does in food. For the most part, I feel the craft beer I drink is “pure” enough where I don’t feel it necessary to spend any extra money to have the “O” word on the label. I will pay more if something is delicious though. And I have a perverse $$$ vs. ABV thing in my head – the higher the ABV, the more I’ll pay! Organic beers tend to have a really light mouthfeel to them. I have asked a bunch of brewers why organic malts tend to lack in texture and flavor and have not received a satisfactory answer. Organic produce almost always tastes better, why not malts? There are good organic beers out there, but it still seems to a work in progress for the brewing world. Maybe because they use less “stuff” in them? Or perhaps others are adding agents like carapils into their brews to manipulate the mouthfeel that don’t qualify as organic. I’ve had their Stout offering before and I would agree it seemed watery and ordinary. Organic is neat and all but not enough to make me drink ordinary beer. Perhaps I’ll change my tune when we get some government brew. It could be made with the tears of successful people and bottled by Chinese slave labor. LOL! I think most folks are all cried out, Brandon. I’m hoping to get some of their bigger stuff to try – I can tell they make good beer, but just not the kind I like (so far). I’ve had a few organic beers before, but none of them blew me away except for Sierra Nevada’s Harvest Estate Ale. That beer tasted fresher than anything I’ve ever had, which makes sense because they grew all of their ingredients in-house and used wet hops. Making it your mission to only use organic ingredients probably limits your creativity, since I’m sure there are fewer malted barleys and hop varieties that can claim Organic status. I missed the Harvest Estate Ale ,and now aoid the dusty bottles of it I’ve seen on the shelves – it’s probably disappointing having it less-than-fresh. My issues isn’t the creativity, it’s the amount of malt and hops they choose to use. The beers I had would’ve been fin turned up to 11, but most were set at 4 to 6. Oh yeah, wait until next Fall for the Harvest. You’re probably right in that organic ingredients are more expensive, so it would cost too much to brew a really big organic beer. Speaking of big beers, I’ll be heading to the Boulder Strong Ale Festival this weekend and will get a chance to taste some brews that we don’t usually get in Colorado, all of them 8% ABV or above. It’ll be interesting to see if any of them are organic. Ahem. Stereotypes are never OK. I own a Prius for all of the reasons you suggested, but this beer doesn’t sound good to me at all. I’m picky with organics. As long as the beer is craft or homebrewed and is loaded with flavor (and sometimes booze), I’m happy. Environmentally-conscious does not usually equate good beer. Yeah…Jim. Way to Piss Zac right off. Zac, if you see him you feel free to sock him right in the face! Despite what you’ve heard, Don, Prius owners are a nonviolent bunch. Sure, we tend to run over our enemies and blame malfunctioning breaks or rogue floor mats, but those cases were all justified. Still, I’ll let Jim slide this time, but if it happens again, he better have his head on a swivel looking out for a red Prius with Missouri plates. That’s all I’m sayin’. If Weeds taught me anything, it’s that you have the perfect car for a drive by shooting – silent and deadly. I’ll be sure to watch my back. God. After posting that, I really hope Jim doesn’t meet his end at the hands of a red Prius with MO plates. If that happens, I’m screwed. Well you know what they say Zac…”Truth is stranger than fiction”, now where can I find a red Prius with Missouri plates in Idaho??? Hmmm…. Hell, where can you find a Prius that isn’t stuck to the grill of a mammoth SUV as a trophy in Idaho? I feel safer now that we have an official record of your threats on my life, Zac. Maybe, but I may have to opt for the drive-by option. No one will know it’s me. Anyway…Interesting comments on the Organic malts being so different from the ‘regular’ stuff. Didn’t know that. Coming in a little late to this thread, but on a related note I have to say that after reading this blog for most of the past year, and trying to track down some of the beers you guys recommend, I am finding myself not able to enjoy the run of the mill craft beers that I used to. For example, recently I had a night where I paired the Nogno (?) Stout with the Saranac Imperial Stout, and there was no comparison. The next weekend I had Victory’s Baltic Thunder followed by a Sierra Nevada Porter, and again, the first totally ruined me for the second. Pairing the Saranac with the Sierra Nevada on a subsequent night, though, was not bad. Notice I said “not bad” – last year this time this combination would have been “good”. You guys might be cheering, but this trend is wrecking havoc on my beer budget and making me fearful I am turning into a *gasp* beer snob. I think I need to go buy some Coors Extra Gold to level set my taste buds. You can see why Don is a transportation planner and not a financial one.